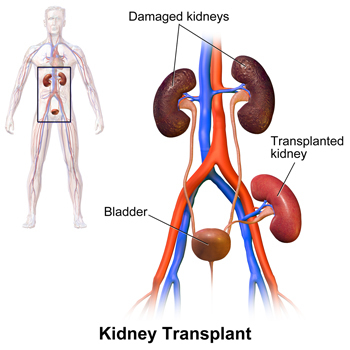 Kidney transplantation is the treatment of choice for end-stage kidney disease (ESKD). Successful kidney transplantation may offer better quality of life and longer patient survival compared with dialysis. Kidney transplantation is a surgical procedure in which a healthy kidney is placed into the body of a person suffering from end-stage kidney disease (recipient).Life after successful kidney transplantation is almost normal. kidney transplantation offers the best treatment option for complete rehabilitation of a patient with end-stage kidney failure. As kidney transplantation saves lives and enables one to enjoy almost normal life, it is referred to as the “Gift of Life”. A living donor should be thoroughly evaluated medically and psychologically to ensure that it is safe for him or her to donate a kidney. A person cannot donate kidney if he or she has diabetes mellitus, cancer, HIV, kidney disease, high blood pressure or any major medical or psychiatric illness.Risk of contracting kidney disease in kidney donors is not any higher just because they have only one kidney. After kidney transplantation, lifelong regular medications(Immunosuppressant) and meticulous care are mandatory. Deceased (cadaver) transplantation involves transplanting a healthy kidney from a patient who is “brain dead” into a patient with CKD. The deceased kidney comes from a person who has been declared “brain dead” with the desire to donate organs having been expressed eitherby the family or by the patient previously, at the event of his/her death.Giving another person a new lease on life is an invaluable gift.